Valentine's Day is all about showing how much we love. We love our friends, we love our spouses and we love our family. Why not show this love with cookies! Often times we give chocolates but why not cookies this year? Isabella's Cookie Company is perfect to show your loved ones how much you care. Isabella's Cookies are unparalleled gourmet perfection. We aspire to make every cookie dream come true. Our cookie creations are unrivaled in variety & made to indulge your guiltiest of pleasures. Our decadent treats are made with the highest quality, pure, fresh and natural ingredients that contain absolutely no preservatives. Isabella's goal is to take original home style baked cookies and give them a sensational twist. Since 2001, Isabella's has been changing the world, one cookie at a time. There are so many cookies on the market that are known for their taste or their texture. Rarely do you find a cookie that bring both to the table and blow other cookies out of the water. Isabella's Cookie Company makes some cookies that are "The Bomb!" If you don't know what I'm talking about, refer back to yourself from the 90's. When you return back to me here, I want to talk more about cookies! As you see from the picture above Isabella's Cookie Company sent me two flavors to try out. Of course I tried the Chocolate Chip Cookies first. These cookies spoke to me right away. They smell delicious, the chocolate chips are very noticeable and the cookie itself is somewhat thick but moist! 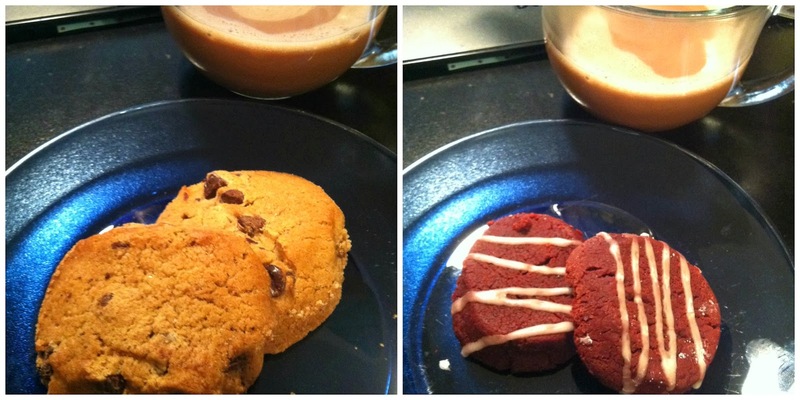 The V-RV (Vegan Red Velvet Cookies with Sweet Vanilla Drizzle) cookies are delicious! They are a little softer than the Chocolate Chip and are as thick. The vanilla drizzle completes this cookie for sure. I do have a small confession though. I am not a woman that prefers Red Velvet Cake. I've had it and didn't care for it. I've had Red Velvet Doughnuts and really didn't care for those. I didn't have high hopes going in. Isabella's knocked me out of my socks with this cookie! Delicious I tell you! The Red Velvet Cookies are perfect to sweeten up your Hunny this Valentine's Day! While you're looking them up online and on social media be sure to look at the other delicious flavors available. Isabella's Cookie Company offers over 30 cookie flavors, so I know you'll find something that will knock you out of your socks too! Disclosure: A special thank you to Isabella's Cookie Company for giving Sweet Cheeks and Savings this opportunity to work with them. We received these items free of charge from Isabella's Cookie Company. No monetary compensation was received or offered, nor were we under any obligation to write about this product. All opinions expressed are honest thoughts. We were not offering any sales or taking orders for this item. We will not receive any compensation in connection with any sales of this item. I am a huge fan of their chocolate chip cookies! YUM! The red velvet was not my top favorite but my daughters did like them! These cookies look really delicious. 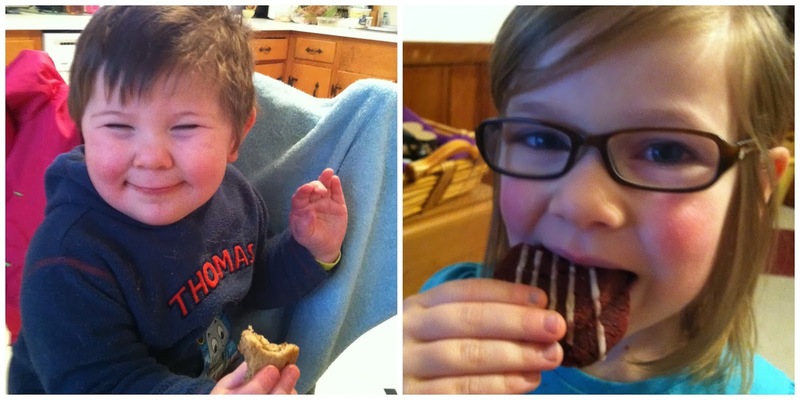 My sons love cookies so I know that they would probably enjoy most of their cookie varieties. Those cookies look awesome. I don't get all the red velvet hype, either.....it tastes just like vanilla with some red food coloring and it' very bland. Chocolate chip cookies are amazing and those look perfect! These cookies look so good!! Chocolate chip are my favorite! Since I no longer bake cookies, I rely on companies like this to provide me with a tasty cookie that I can pass off as mine. LOL.... beats baking. The vegan red velvet cookies look amazingly delicious. Matter of fact, they all do! Your babies are the cutest they look like they love those cookies. My kiddos will have to try these out! I tried their cookies a while back, they're absolutely amazing. I really need to check out all the new flavors they have added. Oh those red velvet cookies are making me hungry! I'll have to try these out sometime. These cookies look moist and delicious..YUMM..thanks for sharing, I had never heard of Isabella's Cookies.. Soo gonna check them out, bet they would make great gifts for friends. Yum! I have never seen this brand before but they look delicious! I like that they are thick and not puny! I have grown to like red velvet over the years but wasn't always a fan. I need to order some of these, I have been trying to find time to make cookies for a week - it obviously is not going to happen. These sound and look so good, I want to try them. I love cookies and these look wonderful. I must order some!